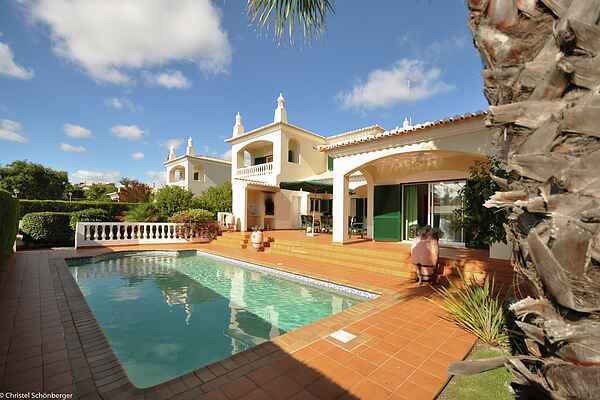 Villa Colaço is a 3 bedroom Villa with private pool located in a very quiet Estate and only 2km from the lush Meia Praia. It has a lovely mature garden with several nice terraces and a porche with built-in BBQ and seperate area for evening dining. The villa consists of a spacious lounge with fire place, 1 ground floor bedroom with bathroom, first floor 2 bedrooms with private bathrooms, veranda/balcony to enjoy nice views towards the ocean.Basement with a games room with Ping-Pong table, tennis table and billiards. Located at only 5 minutes’ drive to Lagos Marina and town center with local commerce, restaurants and a lively nightlife. Ideal to spend a relaxed and enjoyable holiday.